When fixing issues reported by users, I often mention that a nightly snapshot build is now available for download. Now, instead of downloading the build with the fix included manually, you can easily switch the update source to Snapshot Builds in version 3.7. In this mode, frequent updates are available. You can always switch back to the Release feed and only get notified once a stable release is available superseding your nightly snapshot build. The upcoming 3.7 release will support copying between arbitrary servers using drag and drop form one browser window to the other. 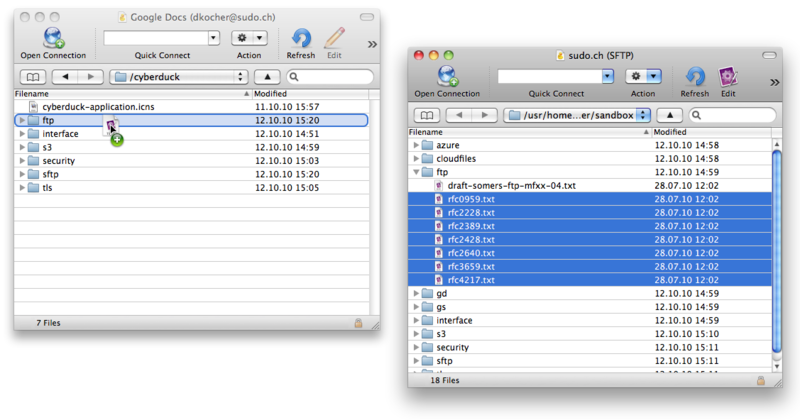 You can give it a try in the latest snapshot build for Mac. 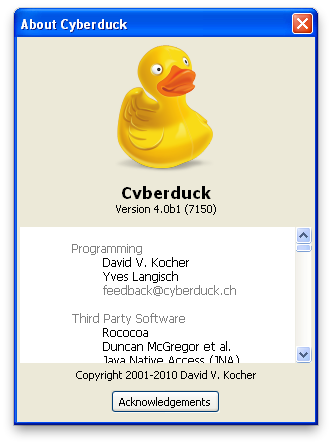 The development of Cyberduck is driven by the supporters donating funds. But there are sometimes additional extrinsic motivations that make me push a feature into an earlier release than initially planed. Below is a great such example sent to feedback@cyberduck.ch to support ticket #4165 opened by Gegard Andersen from Teknologidivisjonen NRK. NRK (Norwegian Broadcasting) is the largest TV/Radio Network in Norway. Approx. 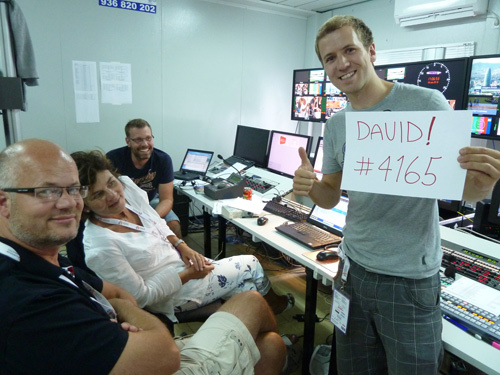 3500 employees who deliver live HD television and radio 24/7. Gegard Andersen works as a Final Cut Pro workflow engineer who specializes in file based workflows. The feature requested allows to upload files with a temporary filename and rename upon completion of the upload, to allow the watch folder to pick up the file for automatic processing which is used in their broadcast setup. We are now seeding the private beta of the upcoming Cyberduck for Windows to a selected number of users who signed up in the last four weeks. We are happy to have a large number of signups and cannot consider everyone just now. But the number of invitations sent out will grow constantly during the next few weeks while we extend the beta to a wider audience. Thanks everyone for their interest and support!